The chart above shows the national annual average for July – August (just to get the most recent data in there). It shows a pretty consistent trend – the broader unemployment rate is pretty close to double the official unemployment rate. And yes, I’ve added the marginally attached to the denominator as well. When we include involuntary part-time and marginally attached persons, the unemployment to job vacancy ratio sky rockets. For Canada the most recent official number is 6.3, but the broader definition of unemployment yields a number of 13 people who would like a job for every job opening. For Ontario, the jump is more dramatic. The most recent official number for Ontario is 8.6, but the *real* ratio is 18.4. 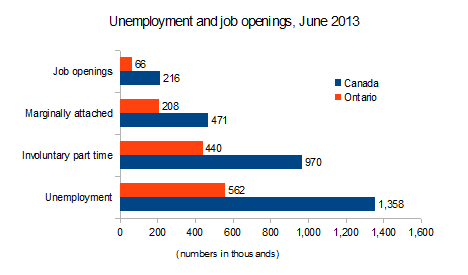 Ontario has about 43% of expanded unemployment, but only 30% of the job vacancies. It’s worth noting that the job vacancies counted by Statistics Canada are the number of jobs that were open at the end of the month. We don’t know how long these jobs have been open, because Statistics Canada doesn’t ask. But in a healthy job market, there are always going to be some jobs open. 216,000 job openings represents only 1.5% of employees. To get an even broader picture of the edges of the labour market, I looked at own-account unemployment as well, meaning self-employed workers who have no employees. Unincorporated self-employed workers who have no employees make up about 7% of the Canadian labour market. Add in those self-employed workers who have decided to incorporate but have no employees, and we’re at 10% of the Canadian labour market. That’s nearly 1.9 million workers who are in a pretty precarious employment situation, to say the least. Over 2 million Canadians are employed in temporary employment as well, giving us an additional 10% of the labour market that is precariously employed. September 17th was the two-year anniversary of the first Occupy Wall Street gathering. The issues that were raised by OWS are still crying out for a serious policy response. This article originally appeared in the Progressive Economics Forum. Photo: drtongs. Used under a Creative Commons BY 2.0 licence.